Impress and invite your family and friends to your lavish and elegant wedding with this amazing work of art. 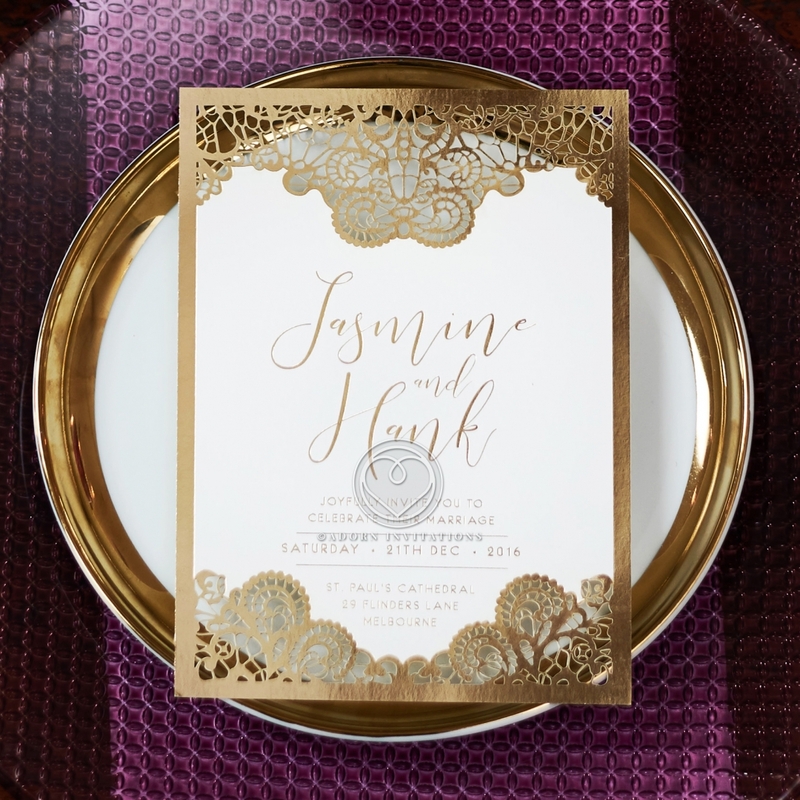 Suited as a ceremony and/or reception invite, this breathtaking stationery features gorgeous baroque laser cut detailing and luxurious foil stamping embellishments making it the epitome of a dream design. Bwedding used the finest craftsmanship and the best in modern technology to produce highly sought masterpieces like this. Exuding romance and uniqueness, the delicate patterns grace the top and bottom sections to form a border to frame your wedding details. The rich gold or rose gold tones richen the creation as it adds a gorgeous polish to enhance the overall appeal. Your names will be stamped in foil using wispy calligraphy to have it stand out from your wedding information. For a more personalized touch, add a paper band where you can have your monogram, crest or even guest names printed on at an additional cost. Envelopes: White - Included, Upgradable. Guest Name Printing: Available By Adding Personalised Paper Band. PRICE INCLUDES: Hot Foil Stamping, Printing, Layout, Envelopes. The details of this invitation are extraordinary! The quality was remarkable. They made a huge impression on our guest. Such a stunning way to announce our special day. I received a sample order for this invitation and was very impressed with the design, colors and the quality of the papers. This invite is really elegant and beautiful. They told me they do this one by one with the laser cutting machine and yet the price is so low. The assembly is also done by hand and they don’t even charge for it. I don’t know how they make a profit but it is a steal from my end. I ordered 120 cards and they were all perfect! I couldn’t believe it myself but they just did a fantastic job. Printing was excellent and the papers were of really high quality. I highly recommend this product and this site. You won’t regret it. I love my invitations! They’re absolutely beautiful and charming. I ordered matching reception cards and RSVPs. Totally elegant and beautiful invitation! It is so fancy but not too flashy, which is just what I want! The quality is definitely outstanding and the service is great! This is a beautiful product with unique design and great quality. I love every aspect of it. I got my invitations last month but came back to order place cards and thank you cards. Ordering is simple and easy. Very nice to be able to do everything online. I’m 100% satisfied with my invitations. The pocket makes it really fancy and formal. I got a ton of compliments for its uniqueness. Online ordering was easy, everything was preassembled, and the price was pretty reasonable, especially with the discount offer I got for ordering a sample. Very pleased with every detail from personalizing to delivery. This site has lots of unique invites, but I loved this design the most. It's so beautiful, stylish and sophisticated. All of my friends were really impressed. I love it! Just received my order. I changed the fonts and the final product looks great. Everything is exactly as I ordered. Who said online wedding invites were cheap looking? These are truly upscale amazing invites! If you’re looking for something simple and elegant, this invitation does it all. Great value for quality and easy online ordering with prompt delivery. Gladly give 5 stars! I received my order recently and was delighted by the final product. Everything did stand up to my expectations! I received my shipment of the invitation cards and I was very happy with it. It was exactly what I expected. I really appreciate their efforts especially it was in English ( in Arabic) and they have done it perfectly. I believe they are really professional. I am looking forward to order from them in the future. The staff were so nice and helpful. Let me start by saying that I'm very hard to please, and extremely picky :-) Therefore, before ordering my wedding invitations I did a lot of research, read tons of reviews and finally I decided to go with this company. I received the proofs the day after i placed my order. After my final approval, I received my invitations beautifully packaged :-) I'm very pleased with the design and the quality of the cardstock. All that at a very reasonable price. In other words, I'm a satisfied customer and would recommend B Wedding to any other bride. The quality of paper is very important to me and our wedding invitations needed to be top of the line! I received samples from different companies and this is by far the best out there! The attention to detail in the laser-cutsl is unparalleled! They were so easy to work with and I had a great experience ordering my invitations. They were always prompt with their responses. The designs are absolutely beautiful, and they look even better in person! I highly recommend their services to anyone who is looking for quality and beauty! Perfect! Just what I wanted. Very tasteful and attractive. I was thrilled and delighted to send them to friends and family. Our invitations came out exactly the way it looked on the website. They came out to beautiful. Everyone all around from friends and family gave me really good feedback on their beauty. I would recommend this vendor for your wedding. I could not believe how amazing these look in person. I was completely stunned. I was so excited to start sending them to my friends and family. They nailed exactly what I wanted and I couldn't be any more happier. Ordered these and everyone loved them! They were simple but super elegant. My fiancee and I were pleased and could not wait to send them out. Every time I look at them I feel a jolt of happiness inside. Highly recommend their service.